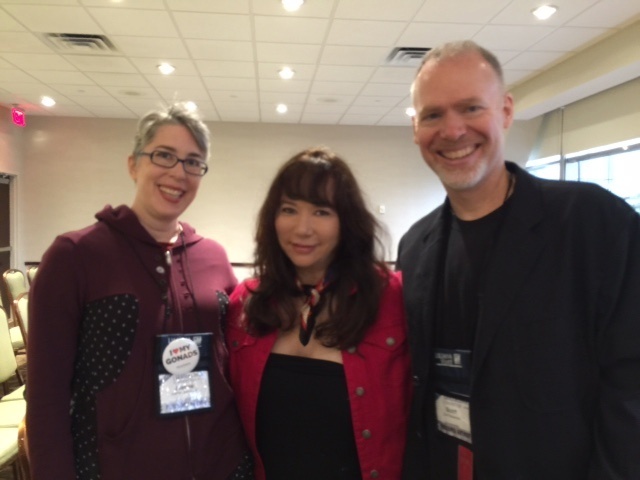 Went to my first RT Convention earlier this month and got to meet one of my YA author heroes, Scott Westerfeld. I love his Uglies series which is long overdue to be a film. He’s just remarkably talented. Here we are, with his spouse, Justine Larbalestier, the author of many novels and editor of some important non-fiction and fiction. Zombies Vs. Unicorns is hers, my favorite YA anthology. 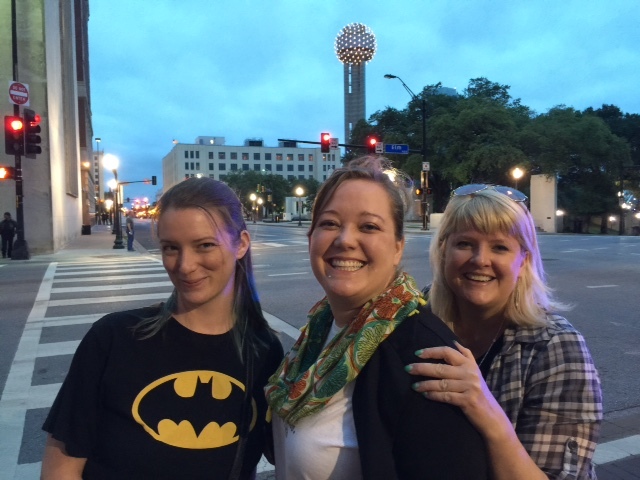 Jodi Meadows, Cynthia Hand and Brodi Ashton, three amazing YA authors who are now also writing together (My Lady Jane). They are so much fun because they’re like a married trio who finishes each other’s sentences. 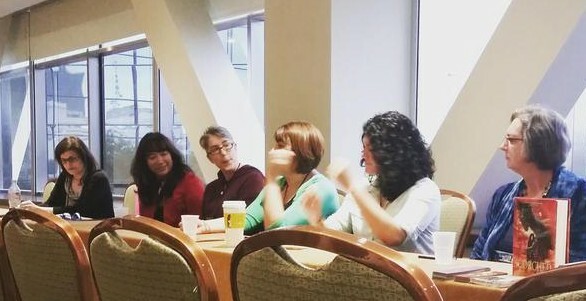 My first panel was “The Writing Life,” moderated by Lea Nolan. This is where I got to meet Justine, who was so warm and friendly and funny — I liked her immediately. And it turned out we were both RT virgins. 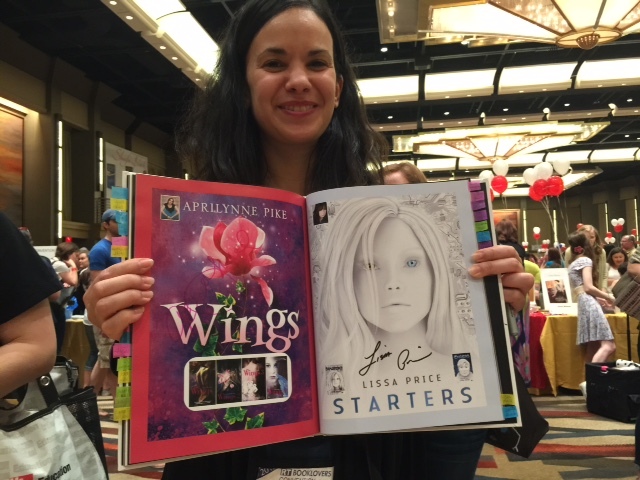 Beside her is the wonderful Christina Lauren, who I’d met at WonderCon back in 2012, Zoraida Cordova, a sister Apocolypsie and one of my buddy authors on the French tour we did last month, and Lorraine Heath (aka Rachel Hawthorne). Mari Mancusi, the last author, was not in this photo. If anyone has a complete photo, please send it. My takeaway from this panel was the story Justine told of one author who burns her manuscript when she finishes the first draft and deletes the file. And then starts all over again. That’s brave! The next day I did a school visit (that will be a separate post). 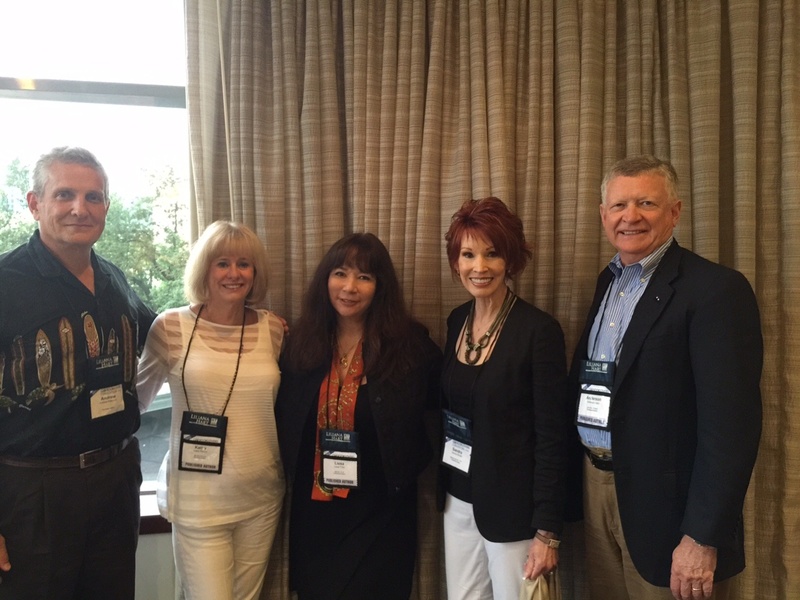 Then I met some of the top thriller writers writing in the adult market today – Andrew Peterson, Kathy Reichs, Sandra Brown and Anderson Harp — a terrific, generous bunch. At the YA author-only offsite private party, our fabulous group came early to eat dinner in case they ran out of food (not really, but you never know). In the magic booth are my roomie, Tamara Ireland Stone, Gretchen McNeil, JR Johansson, Zoraida Cordova, Bree Despain, Amalie Howard, me, Page Morgan (dead ringer for a younger Maggie Gyllenhaal), Kady Cross, and Victoria Scott, who organized the party. 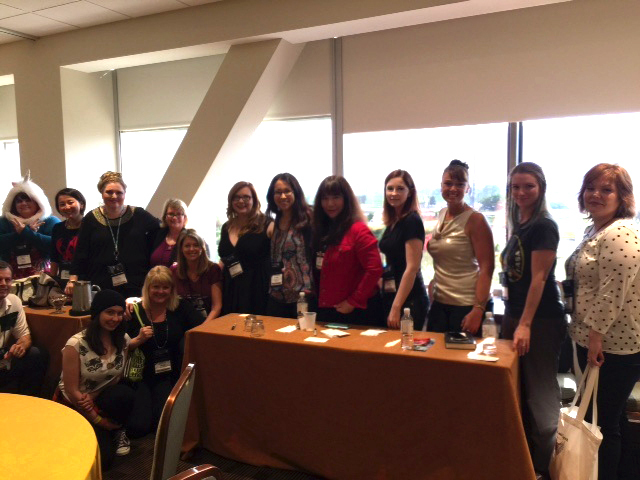 Then a few more YA authors showed up. This is a good chunk of the YA track at RT. Scott Westerfeld taught me all about tonic water — I was clueless about it before, but now I know that Fever Tree is one of the delicious ones. This was a fun party. 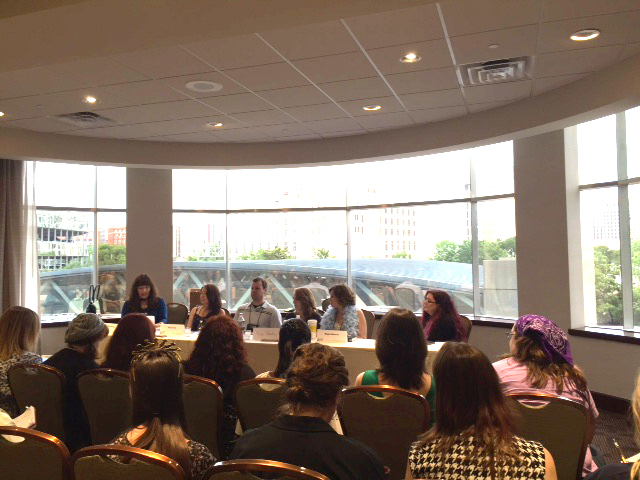 The next day I moderated the YA Thriller Panel: Welcome to the Dark Side with an incredible group of best-selling authors: Susan Ee, Brendan Reichs, Kimberly Derting, Kami Garcia, and Melissa Marr. Becca Fitzpatrick had flight problems and Kim graciously stepped in for her. There was much laughter on this panel. Saturday is the BIG signing day at RT. Our YA rows were on the left. First in my line were three librarians/teachers who said they always look for me – but this was my first time in Texas! It was great meeting all the readers and fans in this four-hour signing. 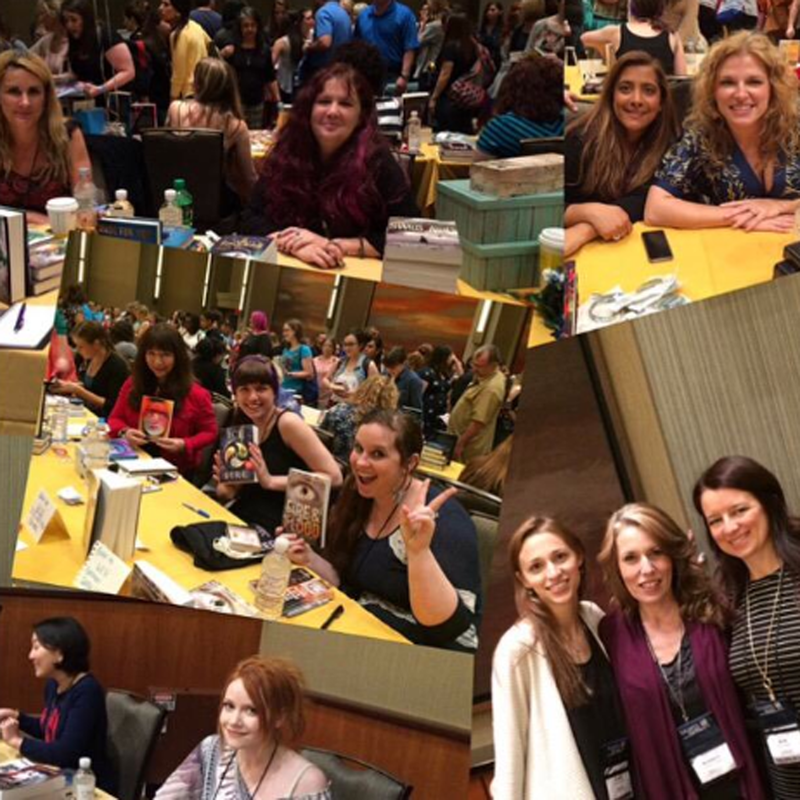 A montage someone created of authors in the YA rows, with Melissa Marr at the top. And here’s my wonderful roomie! You can see her upcoming YA book, EVERY LAST WORD — oh, can’t wait for it to come out on June 16th. This lovely French reader missed seeing me in Paris but came to RT! And the last event for me (and many of us) was The Match Game, hosted by the always vivacious Gretchen McNeil (standing, 5th from left). 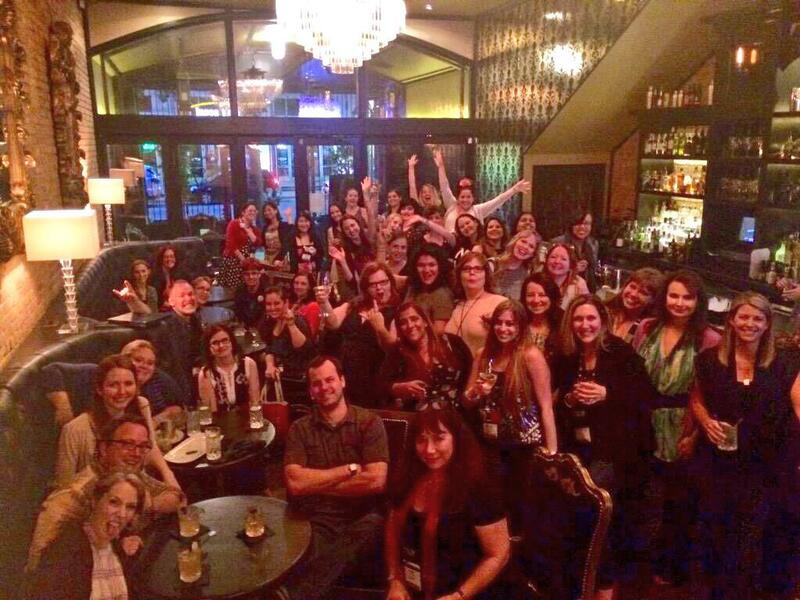 The only guy, Brendan Reichs, just barely in this photo (look far left) kept us — and the audience — laughing. Marie Lu and I couldn’t resist jumping in the photo booth — this is the wacky, Texas-style result. 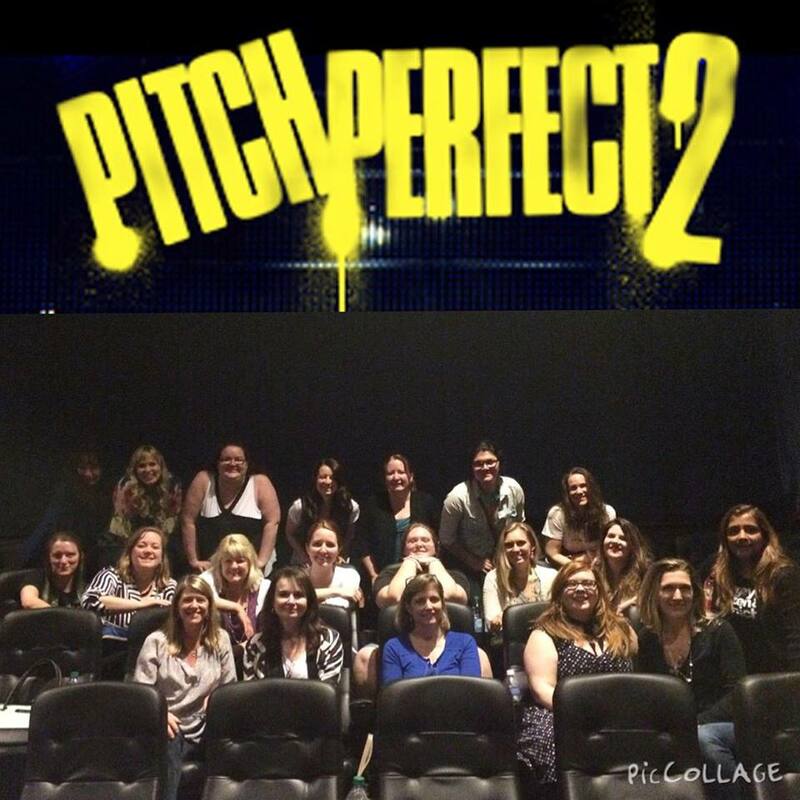 Tamara had this dream of getting a bunch of us together to see Pitch Perfect 2 which opened that weekend. She managed to pull it off, and even got us a reservation at the best Thai restaurant I’ve ever eaten in, and that includes Thailand. 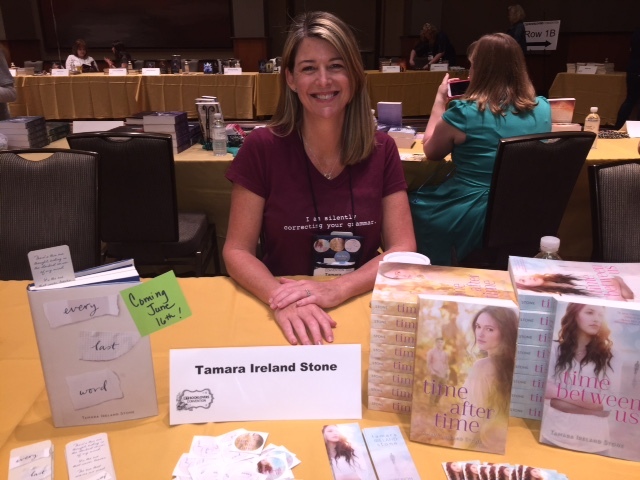 RT is an amazing conference and many people volunteered their time to make it work: Diane Stacy, Cindy Walker, Becky and Pete Anderson of Anderson’s Book Shops, Kami Garcia and Melissa Marr to name just a few. Thanks so much to all of you!